While our products are designed to keep your dog looking sharp and feeling comfortable day in and day out, there are a couple of things you can do to help ensure that this happens. Here's a few tips on how do do this. A puppy may have been "naked" until the day you picked her/him up, and as such, will not be used to a collar or harness. Until they learn that collars and harnesses mean fun things like walks or care rides, they will need some time to get used to this new "thing" you have put on them.There is nothing more disheartening that putting a brand new collar, harness or leash on your new pup only to find it ripped to shreds 10 minutes later! So a word of caution: If you have a new puppy or dog, do not leave them unattended in your new collar/harness until you know that they will not chew through it. Our advise: Put the collar on and stay with them for a while. Watch to see if they try to get their teeth on it it. If they do, a firm "no" and distraction to a chew toy may help. If you must leave them, take the collar/harness off until you can be with them. Every puppy is different, as is their teething period. 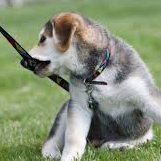 Adult dogs will chew too, especially if the item is different (going from a collar to a harness - harnesses feel vey constraining to a dog at first). Some folks recommend "apple bitter", a chew deterrent that has worked for many. While we can't guarantee that it will work for all, it may be worth trying. Our products are machine washable (delicate cycle, warm water) and our fabrics are colorfast, so don't be afraid to put it in the wash every once in a while. The hardware can get noisy in a machine, so we suggest a laundry bag to keep the clanging to a minimum. Please air dry your collar - dryer heat will prematurely wear and fray the nylon. And if your collar is red and your dog is white, wait for the collar to dry before putting back on your dog - some red dyes have been known to bleed a little when wet. Note that with nylon webbing, some reds/pinks will fade with prolonged exposure to sun, pool water, and oceans. Nylon, unlike polyester, is not quite as colorfast. If you've purchased plain nylon collar in these colors, we suggest you take these collars off before using them in these conditions. Any collar or leash will show wear with time, usually in the form of fraying edges or pilling of the fabric's surface. We've created a little video that shows you how you can easily clean this up with a sharp pair of small scissors. While it doesn't really take care of severe issues (tearing for fabric from friction or biting), it works for everyday wear and tear. We always suggest having a spare so that when you are washing one, your dog has a back up. Besides, you wouldn't wear the same shirt everyday, 365 days a year, would you? Anything can happen once our collar is not on your dog. We've heard some interesting stories! To keep your collar safe and intact, do not leave it somewhere where it can fall on the ground (and get run over, stepped on with heels, chewed by dogs, etc). Not only will the collar get damaged and look bad, you will void the collar guarantee.